MCCC GP Training encourages supervisors, medical educators, and registrars to incorporate latest research into clinical practice. We also encourage people to undertake research training, design, conduct, and publish high-quality research. MCCC expects all clinicians and medical educators to be research literate and able to utilise research findings in their practice. Our Education Portfolio Manager – Research, Dr Duncan Howard is our ‘research champion’ and oversees development of this portfolio within the medical education team. In 2017 a ‘research experience’ survey was sent to MCCC’s Medical Educators as part of a Professional Development session that aimed to inform the identification of research mentors, teachers and ‘champions’. Four research-related themes: the GP as educator and life-long learner; critical thinking; clinical reasoning; and evidence-based medicine are explicitly embedded in every learning program in the curriculum. Research skills, critical thinking and evidence-based medicine are also addressed as part of the Core Skills 1 and 2 learning programs, delivered at the beginning of GPT/PRRT1 andGPT/PRRT2 . In addition to workshop sessions, MCCC e-Learning (MeL) has a number of modules on research literacy that are used in self-directed pre- and post-workshop activities (e.g. rational investigations, pathology testing interpretation and evidence-based medicine modules). 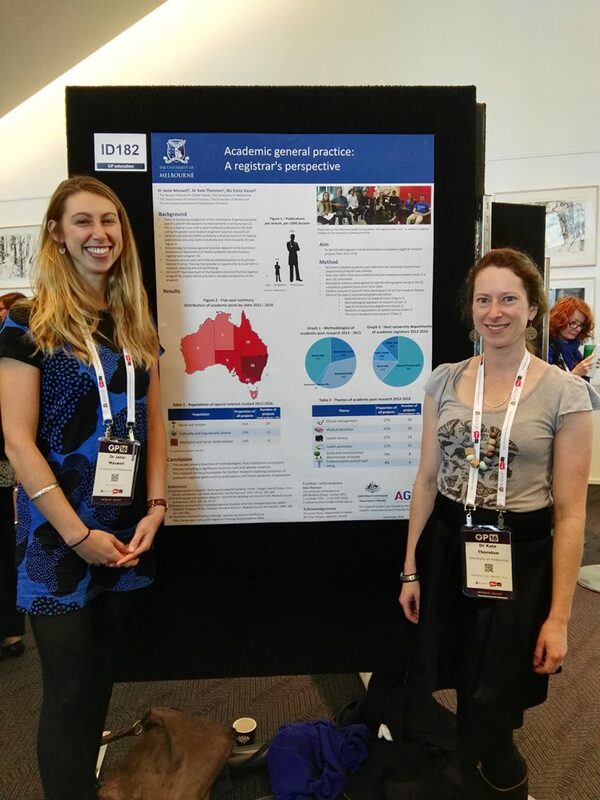 Pictured above: MCCC academic registrars Janie Maxwell and Kate Thornton at GP16 with their poster summarising academic posts. (Image courtesy Dr Janie Maxwell, Nossal Institute for Global Health).